Sophisticated Veil works to prevent your skin’s biggest challenge - premature aging. While supplying your skin with the most effective and advanced anti-aging ingredients (peptides, and Vitamin E and C with long-term benefits), Sophisticated Veil immediately enhances your skin, making it plumped and firm with a distinctly supple and beautiful look. Sophisticated Veil’s deep moisturization improves and refreshes your skin’s appearance on a daily basis. As its name implies, this unique serum gently wraps your skin in a nourishing “veil” that is sheer, breathable and very protective. Preventing loss of hydration, it instantly gives your skin a “lifted” and brightened appearance, and makes your skin smoother and softer to the touch. This formula is made with superior natural oils - Rose Hip, Borage and Evening Primrose, which have high amounts of essential fatty acids that are known to be very important for your skin’s overall health. These oils will not clog your skin’s pores. The Luxtural® Exotic Extracts Complex, with its great natural antioxidant properties, is in every one of our formulations. All of Luxtural’s Products are naturally preserved. YOU WILL LOVE the experience of Luxtural’s Sophisticated Veil. Recommended for skin that’s showing its first signs of aging or for skin that looks tired, dull or lacking vitality. Instructions: warm a small amount between clean fingers to help release its distinctive ingredients. Massage gently into the face, including crow’s feet and neck, breathe deeply and enjoy the natural smell. For best results, prior to this application, use LUXTURAL® Hydrating Mist, "Mystique Fountain”. 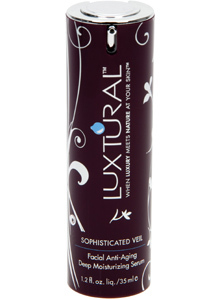 Follow with the application of LUXTURAL® Moisturizer “Silk Premonition” and then apply Sophisticated Veil.